ECO-STEPS COATINGS was developed to fill the need for a reliable, waterborne finish that would not only outperform its solvent counterparts, but also make the transition to water simple. A complete water base system, there are stains, toners, glazes, and of course finishes. From novice to the professional finisher or the production facility there is an E.S.C. system that is right for your needs. 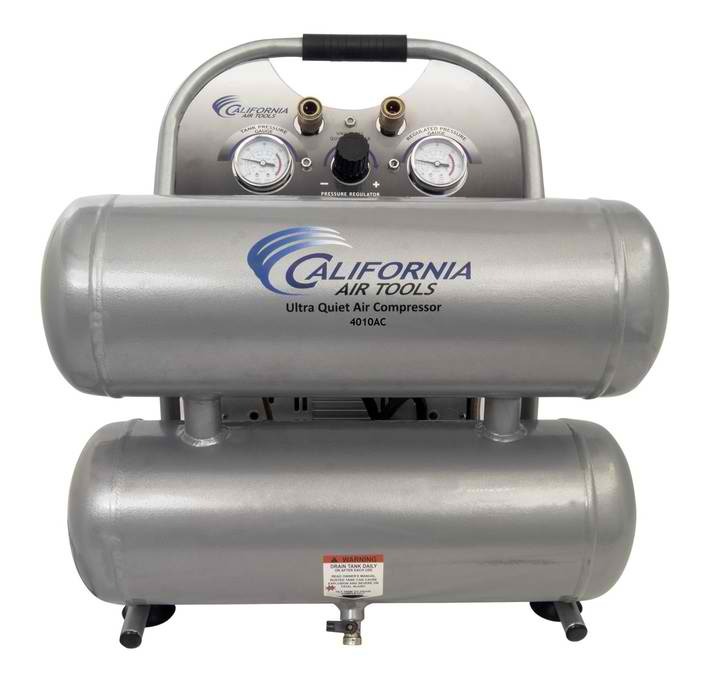 1.0 HP (Rated/Running) – 2.0 HP (Peak) 1.6 Gallon Aluminum (Rust-Free) Tank 3.80 CFM @ 40 PSI 2.35 CFM @ 90 PSI The CALIFORNIA AIR TOOLS 1610A Ultra Quiet air compressor is designed to be one of the quietest air compressors in the industry having only 60 decibels of sound. The powerful 1.0 HP motor operates at only 1680 RPM creating less noise and less wear.The Oil-Free Dual Piston Pump System is engineered for high performance and durability. 2.0 Hp (rated / running) Motor 4.6 Gallon Aluminum (Rust-Free) Twin Air Tank 7.00 CFM @ 40 PSI 5.30 CFM @ 90 PSI 125 PSI (Maximum) NEW! (2014) “Easy Start Valve” Allows for a no load start, for a low start up amp draw. 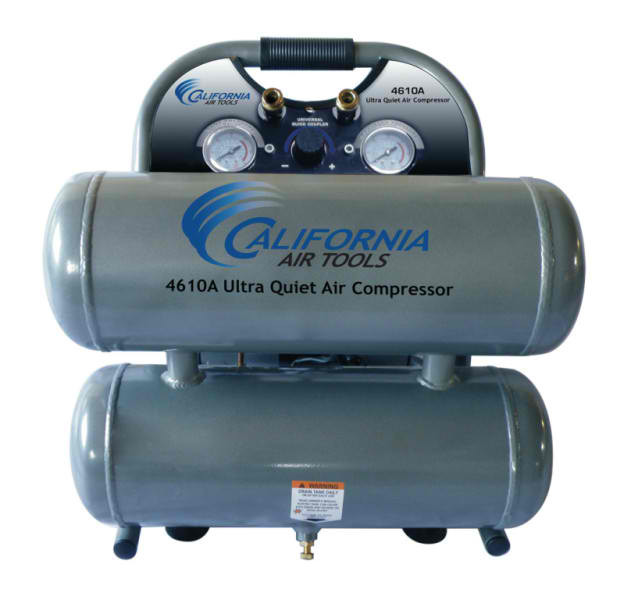 Only 14-amps The CALIFORNIA AIR TOOLS 4620A Ultra Quiet Air Compressor is designed to be one of the quietest 2.0 horse power air compressors in the industry having only 70 decibels of sound. The powerful 2.0 HP motor operates at only 1680 RPM creating less noise and less wear. 2.0 Hp (rated / running) Motor 4.6 Gallon Aluminum (Rust-Free) Twin Air Tank 7.00 CFM @ 40 PSI 5.30 CFM @ 90 PSI 125 PSI (Maximum) NEW! (2014) “Easy Start Valve” Allows for a no load start, for a low start up amp draw. Only 14-amps The CALIFORNIA AIR TOOLS 4620A Ultra Quiet Air Compressor is designed to be one of the quietest 2.0 horse power air compressors in the industry having only 70 decibels of sound. 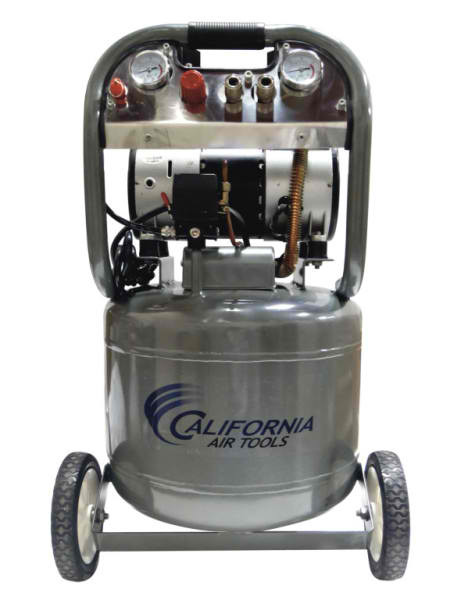 2.0 Hp (rated / running) Motor 4.6 Gallon Steel Twin Air Tank 7.00 CFM @ 40 PSI 5.30 CFM @ 90 PSI 150 PSI (Maximum) The CALIFORNIA AIR TOOLS 4620C Ultra Quiet Air Compressor is designed to be one of the quietest 2.0 horse power air compressors in the industry having only 70 decibels of sound. The powerful 2.0 HP motor operates at only 1680 RPM creating less noise and less wear. 2.0 HP (Rated/Running) 10.0 Gallon Steel Air Tank with Wheel Kit 7.00 CFM @ 40 PSI 5.30 CFM @ 90 PSI NEW! (2014) “Easy Start Valve” Allows for a no load start, for a low start up amp draw. 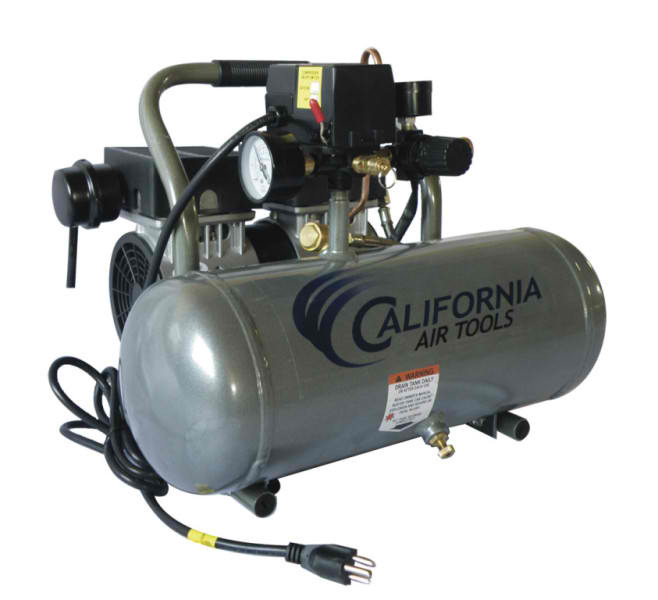 Only 14-amps The CALIFORNIA AIR TOOLS 10020 Ultra Quiet air compressor is designed to be one of the quietest 2 horse power air compressors in the industry having only 70 decibels of sound. The powerful 2.0 HP motor operates at only 1680 RPM creating less noise and less wear.